1. 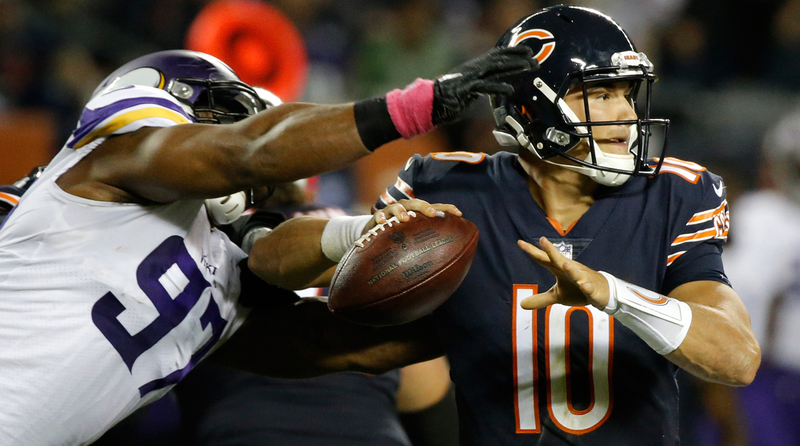 The silver lining for Chicago: there’s a lot to like about Mitchell Trubisky. He’s mobile, both as a runner and thrower. The Bears looked to get him on designed movement in obvious passing situations (a great way to hide your offensive tackles against beastly edge rushers like Everson Griffen and Danielle Hunter, by the way) and Trubisky, for the most part, performed well. The game-losing interception to Harrison Smith obviously hurt, but the rookie will learn. That mistake doesn’t override the fact that Trubisky has a skill set the Bears can design parts of their system around. There’s a snappiness to his throws, including when he’s on the move, where he has the athletic balance to gather his mechanics and maintain his tight release. Trubisky’s legs alone make him a better fit for this offense than Mike Glennon. 2. The, um, dark lining: Besides being surrounded by the same paucity of offensive weapons that Glennon suffered through, Trubisky plays opposite a defense that can’t force turnovers. The Bears have just three on the season after posting a league-low 11 all of last season. That’s a problem when Chicago’s foundation is two-deep zone coverage. Mitchell Trubisky finished his debut with 128 yards on 12 of 25 passing with one touchdown, one interception and one fumble lost. 3. A tip of the cap to Case Keenum. He held down the fort in Sam Bradford’s absence in Weeks 2-4 and was totally prepared when his number was called just before halftime at Soldier Field. Credit offensive coordinator Pat Shurmur and quarterbacks coach Kevin Stefanski for putting the fifth-year pro in position to succeed. Minnesota’s offense features a lot of designer route combinations to exploit predicted coverages. It was evident last week against Detroit that some of those concepts are less effective against a two-deep safety defense, and so on Monday the focus shifted to up-tempo play-calling and designed quarterback movement. Keenum, whose work ethic is admired around the Vikings facility, took ownership of this game. • It’s no surprise Jerick McKinnon wound up being The Guy ahead of Latavius Murray. McKinnon, thanks to Minnesota’s up-tempo approach in the second half, rushed for 95 yards on 16 carries and had team-high 51 yards receiving. He’s not only more agile than Murray but, despite being a half-foot shorter and almost 15 pounds lighter, McKinnon is a better finisher.